The Multi-channel RAMANRXN2™ analyzer enables the use of a single baseunit to support up to 4 probes. The RAMANRXN2™ 4-channel Raman analyzer operates sequentially allowing both fast analysis per channel and programmable channel interrogation. The ability to follow several different potential reaction pathways can significantly speed up early process development by studying parallel batches, removing bottlenecks in the scale-up pipeline, and optimizing the process chemistry throughout its life cycle. The RAMANRXN2™ fiber-coupled Multi-channel Raman analyzer serves the needs of the analytical Raman market, process analytics, chemical, and polymer markets, as well as the pharmaceutical and bioprocessing markets. This analyzer can be combined with data acquisition software to comply with GLP/GMP guidelines, and acquired Raman spectra can be converted to process understanding using multivariate analysis (MVA) approaches to allow control of pharmaceutical and biopharmaceutical processes in support of QbD goals. 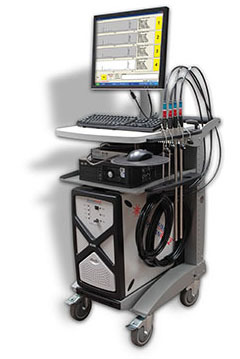 Kaiser's Raman analyzers combine Raman filters, rugged spectrographs, high performance CCD detectors, compact NIR or VIS lasers, and fiber-optic Raman sampling probes to produce a quantitative Raman-based chemical sensor. An ergonomic trolley is available for the RAMANRXN2™ analyzer as an option. 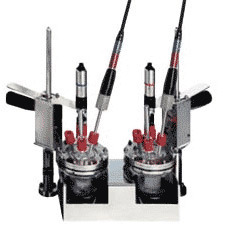 This trolley comprises built-in probe and optic storage, the ability to mount a routine-analysis sample compartment, fiber storage, and the analyzer control system.